2010 Race Results Are Now Available! That was fast. 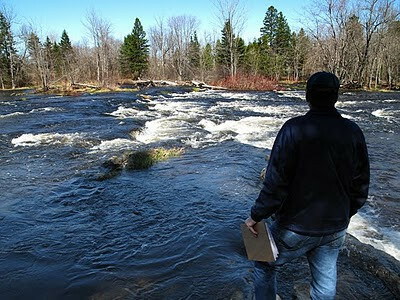 Bangor Parks & Recreation released the full results of the 2010 Kenduskeag Stream Canoe Race earlier today. 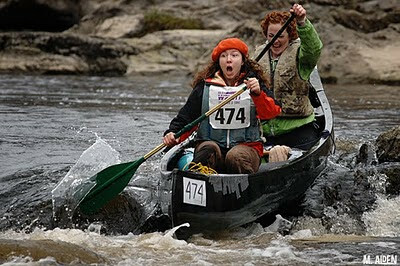 Download the 2010 Kenduskeag Stream Canoe Race Results (pdf file). 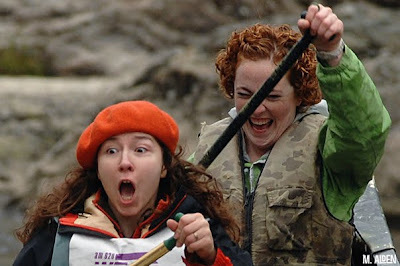 2010 Canoe Race Photos Are Now Online! The 2010 photo galleries are now up and running! Once again, I set up at the Shopping Cart rapids this year. While I can't say I captured every single person in the race, I gave it the old college try. Go to the Race Photos page on my website to check out the new shots! And by the way, the print sales keep the Kenduskeag website up and running, so thank you for your support! UPDATE 4/16: Well, a lot can happen in 72 hours! 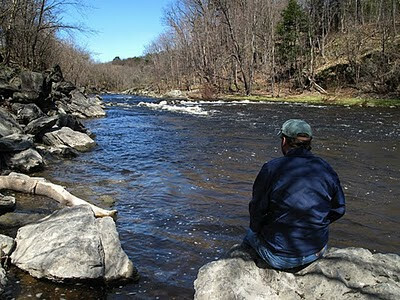 The stream has dropped almost a foot since I filed this blog entry. 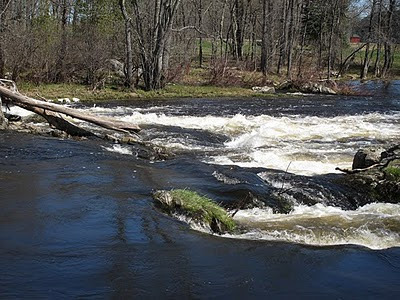 It's even "bonier" than I described earlier, and the rapids aren't as forceful now either. There will be some bumps and scrapes this year, and the race looks to be a slog. But for many people, it will be fun race no matter what. 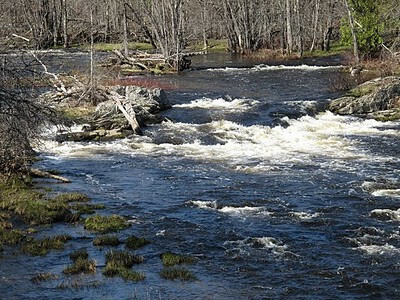 What a beautiful day to stroll along sections of the Kenduskeag Stream. As in years past, I went to scout out the Kenduskeag with veteran racer Chris D'Amico, who is about to participate in his twenty first Kenduskeag. So if you were born around the time Chris first did the race, you're almost old enough to drink a celebratory beer after a day of paddling. Just saying. It was a nice, uneventful walk although I managed to get a mild sunburn after it was all said and done. Oh, and we found a deer tick hitching a ride with one of us after shuffling around Six Mile Falls. So you might want to watch out for that - they're out there! The stream is on the lower, mellower side and at the same time the stream is not too "pushy". 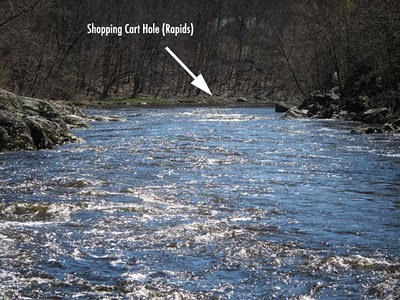 We like to start at the Shopping Cart area (the rapids closer to downtown Bangor) and work our way upstream. 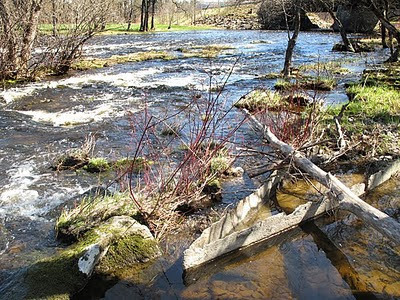 The water levels seemed about the same as in 2009, although last year the Shopping Cart rapids seemed a bit "tame", whereas this year that section of rapids seems "snappy". There's more force going through that ledge notch, along with a pretty good section of standing waves following. Keep in mind that these photos do not really give you the full effect of the rapids in terms of size and swiftness. I shot these pics with a relatively wideangle lens, and the perspective sort of flattens things out in such a way as to make the rapids seem almost unimpressive. 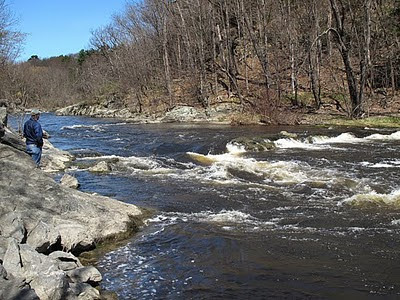 These rapids are respectable, so don't let these pics fool you! Certainly the wave train following the drop at Shopping Cart seemed pretty respectable. Paddlers should have some fun negotiating those standing waves! But this is par for the course at the Shopping Cart, really. Here's another downstream view of the wave train (or "tongue", as I call it) to give you a bit more of an idea. Looks like 40-odd feet of bad road! I had to point out where the Shopping Cart Hole is in this particular photo, because you literally can't see it when you are approaching it in your boat. Little wonder that this area catches so many people by surprise. It's definitely a "gotcha!" section of the Kenduskeag. So how will you know you're getting close to the rapids if you can't see them coming? Look for river vultures (spectators) on river right! They'll be hovering around the boulders in front of what appears to be a flat space on the stream, but there's a reason they've gathered in that seemingly unimpressive area. You can't see the drop until you're almost on top of it. Just a heads up! Upstream from the Shopping Cart is an area we call the Washing Machine. It's basically that first set of rapids you encounter in the bend of the stream after you've portaged around the Maxfield Mill area, near Lovers Leap, where you cross the road with your boat. 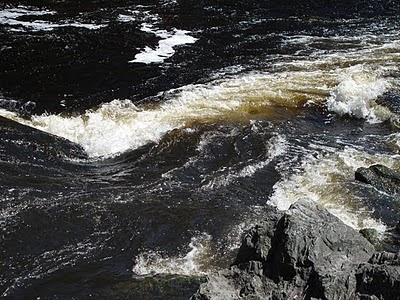 The Washing Machine causes problems for some paddlers - these rapids will wake you up with a little taste of what lies ahead at the Shopping Cart. 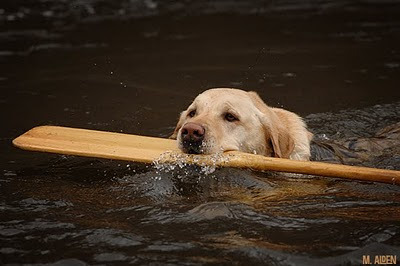 Side note: a free paddling clinic will be held on the Kenduskeag on Thursday, April 15th at 4pm. 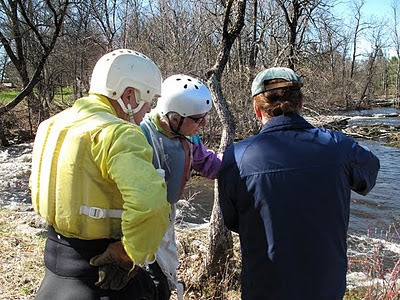 Hosted by the Maine Canoe & Kayak Racing Organization (MaCKRO), this clinic will begin at Six Mile Falls and end downtown. Shuttles will be available for you and your boat. If you'd like to preview these tricky areas at your own pace and and your own comfort level with experienced paddlers, I highly encourage you to try to take advantage of this opportunity! Meet up at the parking lot alongside the Kenduskeag Stream just up from the Mill St. bridge (Harlow St.) The parking lot will be on your right. You can't miss it; there will be other cars with boats already there. You may have to fill out an ACA waiver form (with which there is a $5 fee per paddler) but the clinic itself is free and open to the public. Abandon hope, all ye who enter Shopping Cart Alley! Just kidding. 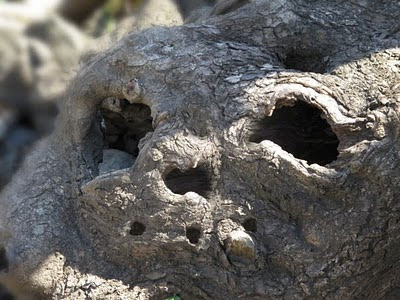 Weird tree trunk, huh? 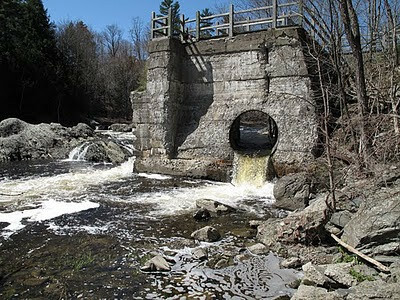 Looking at the picture above (the remnants of the Flour Mill Dam) - wouldn't it be nifty to be able to take a shortcut through that sluice tunnel if the water was just a bit higher on the exit? Well, that's just what some of the racers did in the earliest years of the Kenduskeag! In the late 1960s this tunnel was an alternative portage. Alas, it isn't nowadays. But you probably wouldn't want to break the back of your boat trying it anyway. 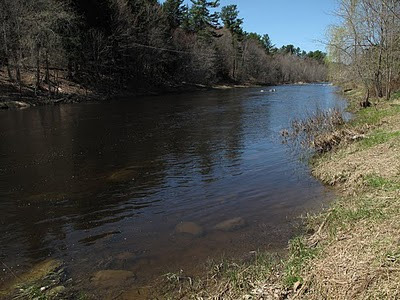 Walking further upstream, this is the take out area ahead of the Flour Mill Dam, and as I mentioned earlier this is a mandatory portage. It will be marked and flagged and a rescue person will be on hand to make sure you pull out. As you can see, the water is sedate. This photo is virtually identical to the shot I took in the same spot in 2009. And now we move on to big, bad Six Mile Falls. The favorite stomping ground of media trucks and river vultures. Guess what? The report I wrote up last year mostly applies this year as well. So rather than reinvent the wheel here, I'm tempted to say that you could direct your attention to the stream report of 2009 (see the archive links to the right. look under April 2009). But there is one notable difference: the options for lining up are a little bonier this year and some areas are blocked by dead trees and other wooded debris. Lots of "stairstep" ledges will make things a little trickier (at least for canoes) on the approach to Six Mile Falls this year. 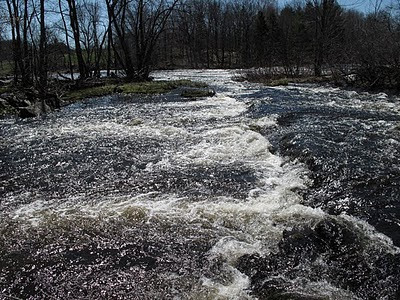 It seemed to Chris D. that the best approaches might be from river left, which is fairly typical if the water is high enough. When we looked at the area, the water was doable. But given a few days of water levels dropping off, what will it look like come Saturday morning? You'll have to check it out for yourself (always a good idea anyway) or ask around to find out. Some people wait until the eve of the race to scout out the stream for that very reason. So what's the big difference this year? You can pretty much take out that middle arrow, for one thing. 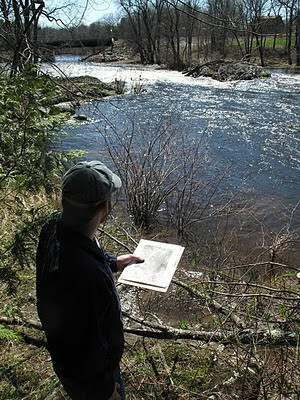 We found that between the ledges and the downed trees, the middle approach to the falls would be virtually impossible. We've never seen so much piled up crap ahead of the falls. 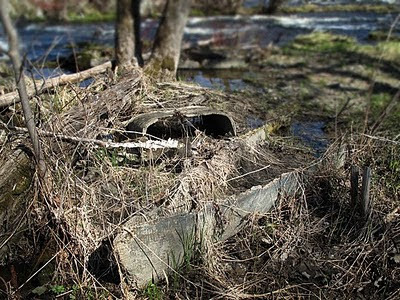 It almost looked like some Godzilla-sized beaver built a dam in the area. Going river left and then either setting up in front of the "jaws" of the falls (the chute area) is one option. 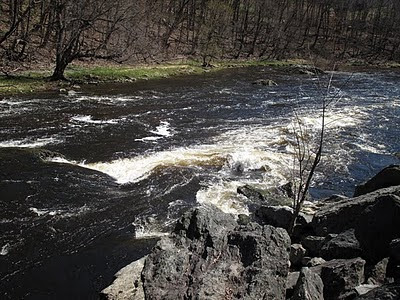 Another would be to try river right, hitting that horseshoe-shaped sluice and spilling out in front of the weedy "red willow island" just ahead of the falls. Overlooking the "stairstep" action ahead of Six Mile Falls, Chris D. thought that kayakers might have an easier time taking a centerline approach to the falls than the open boaters, but even a couple of seasoned kayakers we spoke with on site felt that they would likely approach the falls from river left or right, and not through the center. For what it's worth. 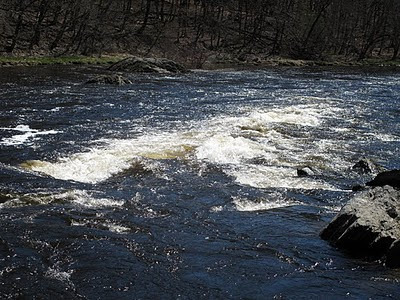 The US Geological Survey installed a brand new water gauge at Six Mile Falls back in January. This gauge measures the depth of the water (among other things). Interpreting the data is another matter, but several people who live near the stream have told me that in their experience, anything below four feet (in terms of depth) translates to "rock garden" paddling. As of this writing, the stream has a recorded depth of a little under five feet at the Six Mile Falls station. 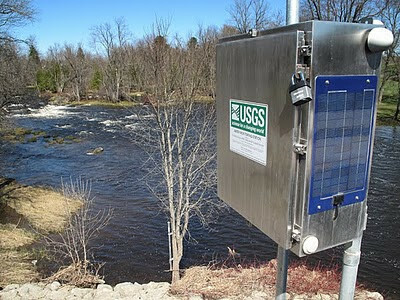 Check out the realtime date online on the USGS water gauge page. Also, note that while the cfs (cubic feet per second) data isn't yet available, I'm told that it might be added in the near future. One of the things that kept cropping up while Chris D. and I scouted the stream was the term "pushy water". Newbies should be pleased to note that the stream isn't too "pushy" this year. The water isn't high enough or swift enough to hurtle you towards a tricky situation without giving you at least some opportunity to prepare. What this means is that you can take a moment in the calmer eddies and pools to choose your lines, prep your paddling partner(s) if you aren't going solo, and orient your boat the way you want to before taking the plunge, so to speak. It was a much different picture in 2007 and even in 2008, when paddlers were rushed into situation after situation. In closing, scout out these areas for yourself ahead of the race, and do keep in mind the MaCKRO paddling clinic on Thursday if you feel you need some pointers or some confidence-building skills. 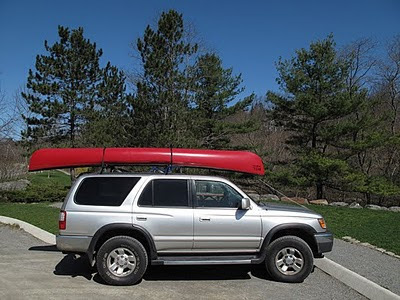 That's what it's there for, and the experienced paddlers at MaCKRO are glad to help. Have a safe and enjoyable race. And remember, keep your paddle in the water! Compiled by Christopher D'Amico and Mike Alden. 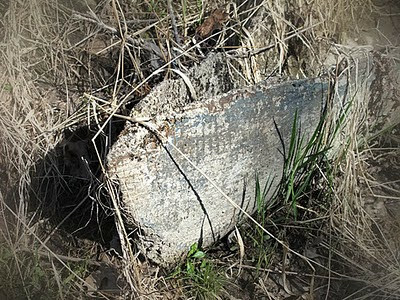 PS - here are a few snapshots of some concrete canoe remains near Six Mile Falls. The engineering department at UMaine would hold student competitions to see which team could build (and race) the lightest concrete canoe. 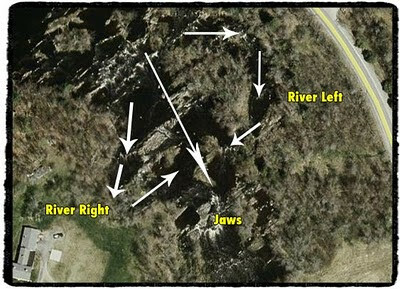 Looks like these particular boats made it as far down the stream as Six Mile Falls before wrecking on the "shoals". 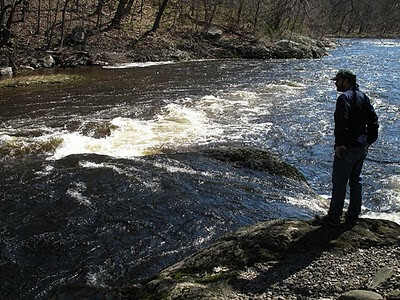 The whitewater season in Maine is almost upon us, and this blog is officially out of hibernation for the next couple of months. Woo-Hoo! The St. George River Race opens things up in just a few weeks, and get this...the St. George River has already iced out. I'll have more on the St. George (including when & where) in about a week. 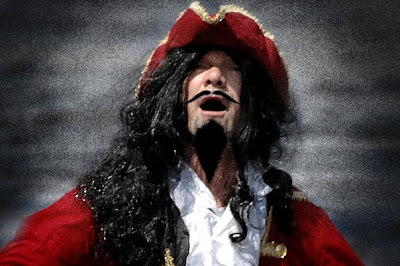 If you haven't pre-registered for the 2010 Kenduskeag Stream Canoe Race, what in the name of Long John Silver are you waiting for?? Download the 2010 form here. Whether you plan to go solo or assemble a motley-looking crew, pre-registration saves you time and money. $36 per paddler this year if you wait until race day to sign up, but only $18 per paddler if you beat the deadline (Friday, April 16th at 1pm).